In 1-quart saucepan, heat syrup ingredients over medium heat, stirring occasionally, until cranberry sauce is melted; keep warm. In medium bowl, beat all pancake ingredients with egg beater or wire whisk just until smooth. (For thinner pancakes, stir in additional 2 to 4 tablespoons milk.) For each pancake, pour slightly less than 1/4 cup batter from cup or pitcher onto hot griddle. Cook pancakes until puffed and dry around edges. Turn; cook other sides until golden brown. 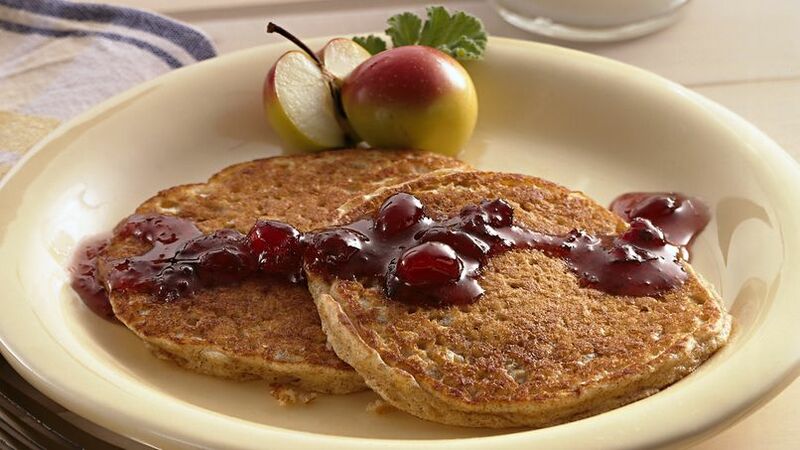 Top each serving (2 pancakes) with 2 tablespoons syrup. Old-fashioned oats are 100 percent whole grain; using them in baked goods adds a delightful, chewy texture and a burst of fiber.